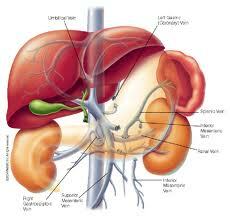 Portal Vein Thrombosis is a medical condition, in which portal vein blockage by a blood clot occurs. Such blockage can be resulted from stomach, pancreas, or liver cancers, or from cirrhosis. Portal Vein Thrombosis can also be resulted from liver abscess, pancreatitis (pancreas inflammation), or cholangitis (bile ducts inflammation). In newborns, this disease can be caused by umbilicus (navel infection). The disease may appear in pregnant females, particularly those who have eclampsia. Portal Vein Thrombosis may also happen in any medical disorder that backs up blood in the portal veins, including chronic constrictive pericarditis, chronic heart failure, or budd-chiari syndrome. Portal Vein Thrombosis may also be resulted from abnormal tendencies for blood to clot. Portal vein thrombosis causes frequently may not be identified. Frequently, the first symptom of the disorder is varicose vein bleeding at the esophageal varices (lower end of the esophagus). The bleeding causes vomiting of blood or coughing up blood. The spleen usually enlarges, particularly, in children with portal vein thrombosis. A doctor feels an enlarged spleen, which can be tender. In approx. 1/3 of the individuals with this disorder, blockage progresses slowly, letting other blood channels (called collateral channels) be around the block and the portal veins reopen. Despite the reopening, the portal hypertention can persist. If a patient has portal hypertention (portal vein high pressure), and a microscopic evaluation of a liver tissue sample shows that the cell is normal; the portal vein thrombosis is a cause. CT (computed tomography) or ultrasound scans can reveal the blockage. Portal Vein Thrombosis diagnosis confirmed by procedure called angiography. The treatment of Portal Vein Thrombosis consists of lowering portal vein pressure and preventing bleed from varicose vein in the person’s esophagus. A surgeon can first attempt to close the varicose vein by applying rubber band or by injecting varicose veins with specific chemicals given through an endoscope (a viewing, flexible tube with surgical attachment). 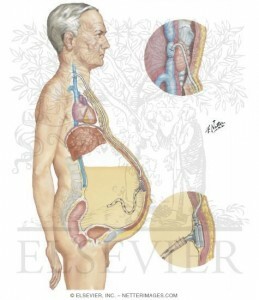 Surgery can be required to create a shunt (connection) between the vena cava and portal vein, resulting in flow of the blood to bypass the person’s liver and lowering the pressure in the portal veins. 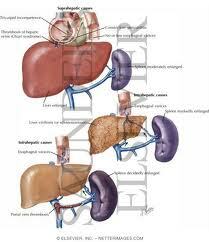 However, bypass surgery increases the liver’s encephalopathy risk (damage of the brain, caused by liver disease).